So after making the decision that we could fit our family of 4 into a smaller house came the next challenge - hubby working from home. We think he is lucky to have a job and so we were open to the news that the office was closing and he would have to start working from home. In our previous home we had a spare bedroom/study but we had bought this house thinking we would be social networking not grafting from home. The only room with any potential for a work space was the lounge. Although our new house was fairly neutral throughout, the lounge was fussy with a feature wall and embellished curtains. To quote Oscar Wilde's alleged dying words it was either me or the wallpaper that had to go. And so before my husband took his last commute to work a rapid makeover began. 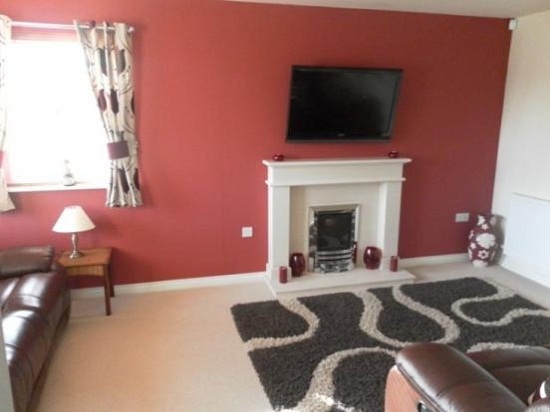 This is how the room looked before we bought the house (please note this is the estate agents' photo). The feature wall was stripped, curtains and poles removed and the room painted. After an intense search a matching desk and cupboard/shelf unit were purchased, new technology installed and off he pootled to his new work station. According to a new soon to be published book The Middle Class: A Loo Book (Fi Cotter-Craig and Zebedee Helm) working from home, among other things (tap water, man hugs), are irredeemably middle class. Not for us trampolines, underfloor heating or Carluccio's - but the rising cost of office space and the squeeze in the economy has made working from home a necessity. Luckily my husband is my minimalist hero and keeps his desk very tidy. How could my friends have suggested that he work in the loft or shed? How about you do you or your partner have to work from home and how do you manage the space? Hmmm, that colour wall would have driven me mad, it's not one of my favourites! You did a good job.....I wish my husband was that tidy! oh not so sure I like that colour- glaring at you from those walls! Good idea to get rid... We don't work from home but have a "wRECk Room" that needs a major overhaul. The new year I think.